Office Hours: M 1:00-2:50, and by appointment. Gun Free Office, contact by email to make alternative accommodations. 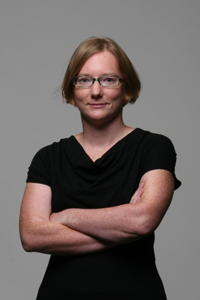 History of Science, Environmental History, US and Caribbean, 19th and 20th c.
Megan Raby is a historian of science and environment whose work emphasizes the transnational connections of science in the US and Latin America in the nineteenth and twentieth centuries. Her book American Tropics: The Caribbean Roots of Biodiversity Science (University of North Carolina Press, 2017) explores the relationship between the history of field ecology, the expansion of U.S. hegemony in the circum-Caribbean during the 20th century, and the emergence of the modern concept of biodiversity. She is also the author of articles appearing in journals including Environmental History and Isis, and she was awarded the History of Science Society's Price/Webster Award for best article in 2016. Professor Raby earned her Ph.D. in the History of Science, Medicine, and Technology at the University of Wisconsin-Madison. Before joining the Department of History at the University of Texas at Austin, she was a postdoctoral fellow at the Smithsonian Institution Archives and National Museum of American History. This course is an upper-division, reading- and writing-intensive seminar. It acts as an introduction to the growing field of environmental history, as well as to a variety of approaches to understanding history at a scale beyond the nation-state. It carries Independent Inquiry, Global Cultures, and Writing Flag designations. Carey, Mark. In the Shadow of Melting Glaciers: Climate Change and Andean Society. Oxford University Press, 2010. Degroot, Dagomar. The Frigid Golden Age: Climate Change, the Little Ice Age, and the Dutch Republic, 1560–1720. Cambridge University Press, 2018. Fagan, Brian. The Long Summer: How Climate Changed Civilization. Basic Books, 2005. Malm, Andreas. Fossil Capital: The Rise of Steam Power and the Roots of Global Warming. Verso Books, 2016. Oreskes, Naomi, and Erik M. Conway. Merchants of Doubt: How a Handful of Scientists Obscured the Truth on Issues from Tobacco Smoke to Global Warming. Bloomsbury press, 2011. Robin, Libby, Sverker Sörlin, and Paul Warde. The Future of Nature: Documents of Global Change. Yale University Press, 2013. White, Sam. The Climate of Rebellion in the Early Modern Ottoman Empire. Cambridge University Press, 2011. Weart, Spencer R. The Discovery of Global Warming. Harvard University Press, 2008. Zilberstein, Anya. A Temperate Empire: Making Climate Change in Early America. Oxford University Press, 2016. Grades will be based on a research project (60% total), several short reflection essays (20%), and participation, which includes signing up and leading class discussion at least once in the semester (20%). Perspectives on Science and Math explores the intellectual, social, and cultural history of science and mathematics, focusing on the 17th century to the present. This is an upper-division history course designed for students in UTeach Natural Sciences. This course has four interlocking goals: to give you an overview of the history of science and math in order to broaden your understanding of subjects you will teach in the future; to enable you to put this broader history and context to work in science and math pedagogy; to improve your ability to research, analyze, and evaluate information; and to improve your writing and communication skills. This is a Writing Flag course. It is designed to give you experience writing within an academic discipline––in this case, history. You can expect to write regularly during the semester, complete substantial writing projects, and receive feedback to help you revise your writing. You will also have the opportunity to read and discuss your peers’ work. For more information about the benefits and expectations of Writing Flag courses, see http://www.utexas.edu/ugs/core/flags/writing. Farber, Paul Lawrence. Finding Order in Nature: The Naturalist Tradition From Linnaeus to E. O. Wilson. Baltimore, MD: Johns Hopkins University Press, 2000. Otis, Laura. Müller’s Lab. Oxford: Oxford University Press, 2007. Watson, James D., and Gunther S. Stent. The Double Helix: A Personal Account of the Discovery of the Structure of DNA. New York: Norton, 1980. Environmental history is one of the most rapidly growing, in-demand subfields of history. At the same time, it is an interdisciplinary field, drawing insight from geography, ecology, cultural studies, and other areas in order to understand changing human relationships with nature over time. This seminar will introduce students to the historiography and diverse methods of environmental history. We will read and discuss a variety of classic and cutting edge texts in environmental history, with an emphasis on global, transnational, and comparative studies. Throughout the semester, several guest speakers (including LLILAS-Benson Visiting Resource Scholar Manuel Valdés Pizzini) will share their insights about particular methods or approaches. Topics may include animal history, disasters, cities, health, environmental justice, political ecology, as well as introductions to regional historiographies, including Latin America. Specific selections will be shaped in part by student interests, with an aim toward preparing students to incorporate perspectives from environmental history into their own research and future teaching. Ede, Andrew, and Lesley B. Cormack. A History of Science in Society: From Philosophy to Utility. Third ed. University of Toronto Press, 2016. Additional required primary and secondary source readings online. Global Environmental History explores how human societies and natural environments have shaped each other in world history. In order to tackle this formidable subject, the course is divided into three thematic units. We will begin by critically examining “bird’s eye views” of deep human and natural history, discussing historiographic controversies over the role of humans in the ancient extinctions; the origins of agriculture; and relationships among climate, society, and disease. Next, we delve into a series of comparative histories of societies’ ways of knowing and making a living in nature. These will examine cultural and economic encounters from the Columbian Exchange through 19th-century colonialism. Finally, we turn to the 20th century in order to trace the transnational flows of global capitalism––commodities, human migrations, pollution, “invasive species,” and environmentalist movements. This course is an upper-division, reading- and writing-intensive seminar. It acts as an introduction to the growing field of environmental history, as well as to a variety of approaches to understanding history at a scale beyond the nation-state. Robin, Libby, Sverker Sörlin, and Paul Warde. The Future of Nature: Documents of Global Change. New Haven: Yale University Press, 2013. Crosby, Alfred. The Columbian Exchange: Biological and Cultural Consequences of 1492. Westport, CT: Greenwood, 1972. Grades will be based on three 6-8 page critical essays (60% total), several short reading responses (20%), and participation, which includes signing up and leading class discussion at least once in the semester (20%). Ede, Andrew, and Lesley B. Cormack. A History of Science in Society: From Philosophy to Utility. Second ed. Toronto: University of Toronto Press, 2012. Additional primary and secondary sources online. Perspectives on Science and Math explores the intellectual, social, and cultural history of science and mathematics, focusing on the 17th century to the present. This is an upper-division history course designed for students in UTeach Natural Sciences. It has four interlocking goals: to give you an overview of the history of science and math in order to broaden your understanding of subjects you will teach in the future; to enable you to put this broader history and context to work in science and math pedagogy; to improve your ability to research, analyze, and evaluate information; and to improve your writing and communication skills. This is a Writing Flag course. It is designed to give you experience writing within an academic discipline. You can expect to write regularly during the semester, complete substantial writing projects, and receive feedback to help you revise your writing. You will also have the opportunity to read and discuss your peers’ work. Berlinghoff, William P., and Fernando Q. Gouvêa. Math Through the Ages: A Gentle History for Teachers and Others. Expanded ed. Washington, DC: The Mathematical Association of America and Oxton House Publishing, 2004.